Tub cutout bathtub conversions involve “cutting out” or removing a section of your bathtub to lower the threshold and make it easier to step in and out of the bathtub. Tub cut out modifications can be done with most types of bathtubs. Whether you have a cast-iron, or steel tub, we can cut out a section of your bathtub to lower the threshold and cover it with a flat step, creating the functionality of a walk-in-shower. If you’d like to still have a functioning bathtub, there is an optional watertight bathtub insert which you can easily remove to use the open tub cutout, or insert to use as a regular bathtub. A tub cut out is one of the most affordable solutions to give you independence. Tub cut outs are ideal for elderly and handicapped individuals looking to save some money or those who want help with safety and accessibility but don’t want to remodel their bathroom. Think this might be the right solution for you? Call us now We are a Milwaukee based company providing tub cutouts and accessible bathroom remodeling options throughout Wisconsin, and Chicago. Tub cut outs are a straightforward option for bathroom accessibility and safety. Where is the best placement of a tub cut out? For a tub cut out the function the safest and best for you, it is important that it is placed in the proper location. The best location for placement of the tub cutout will depend on your individual needs, and it is rarely best to place the cut-out in the center of the bathtub. 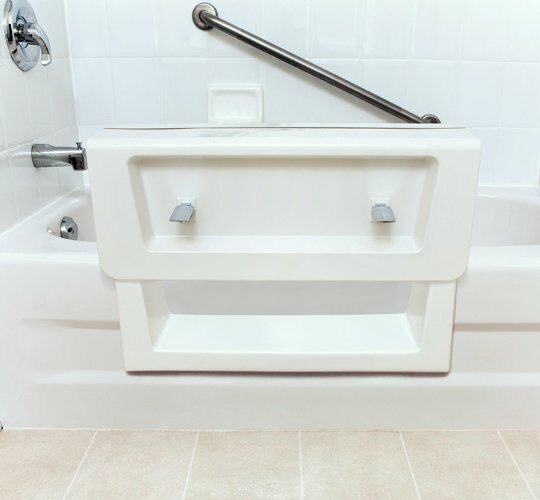 For most individuals, the tub cutout will be best placed towards the faucet side of the bathtub to allow for safer and easier transitions in and out of the bathtub. The thickness and shape of your bathtub may limit how far forward the tub cut can be placed, and is important for you to verify prior to installation. If you use tub transfer bench, a tub cutout can help by lowering the height that the individual has to lift their legs over the tub. How expensive are tub cut outs? Cost for tub cutouts will vary depending on what your bathtub is made of: fiberglass bathtubs are easier to cut through than steel or cast iron tubs which require more time and costly cutting materials and blades. Another variably that may affect the cost of your tub cutout, is the type of cutout system that you purchase. If you choose a tub cutout that can be converted between an open cutout versus watertight seal. Cost of a tub cutout may vary from $1000 – $1600. How long does it take to install a tub cut out? Installation of a tub cutout can be performed in one day, and sometimes just in a few hours. The time required depends on the material that your bathtub is made of, and takes longer for metal bathtubs. To allow a full waterproof cure, we ask our customers to wait 48-72 hours before using their tub or shower after their tub cutout has been installed.